Who would not want to read a book of secrets…Except, this is one you listen to. 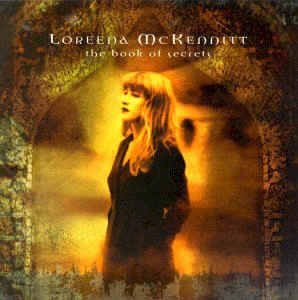 The songs on this album are all a reflection of Loreena’s knowledge of the world. She seems to be seeking, exploring possibilities and expressing what she has captured. 1. Prologue – inspired by “From The Holy Mountain” by William Dalrymple. There is a certain emptiness and remorse woven into this piece. Maybe a longing for what could have been. You can almost imagine monks traveling from monastery to monastery to collect ancient wisdom. 2. The Mummers’ Dance – Loreena incorporated the chorus of a traditional mumming song and her words take on new meaning when you realize that mumming involves a group of performers who dress up in masks and clothes bedecked with ribbons and carrying branches of greenery. This “mumming” has its roots in tree worshiping, which will make you consider why you bring a tree in at Christmas time, at least it is worth considering. Although I think people are more interested in worshipping materialism at the malls. 3. Skellig – this song becomes almost hypnotic as it seems to spin in circles or maybe it is more like the flicker of a candle that grows brighter as you approach it on a dark night. 4. Marco Polo – Loreena has interwoven an authentic Sulfi melody at the beginning and middle of this piece. It is rather intoxicating. 5. The Highwayman – Friends suggested setting Alfred Noyes’ poem “The Highwayman” to music. While in the studio, Loreena imagined the sound of horses galloping down a moonlit lane. Best to listen to this song while reading the lyrics, which are included and paint a tragic tale even more dramatically in song. 6. La Serenissima – Delicate and haunting. 7. Night Ride Across the Caucasus – the notes explain how people are affected by music and either hear the spiritual meaning or the material sound. 8. Dante’s Prayer – inspired by Dante’s The Divine Comedy (a vernacular poem in 100 cantos), Loreena thinks about the human condition and how we all want to believe there is a place better than our own. An almost sorrowful and yet hopeful melody. Italian poet, Dante (1265-1321) gave an explanation of what happens after we die and this question is still just as controversial today. Perhaps she was inspired by: “Temo di perder viver tra coloro, che questo tempo chiameranno Antico.” (I fear I will lose life among those who will call this time ancient.” She sings “Please remember me.” She also speaks of “Beyond the ice and the fire.” The innermost pit of hell is for Dante, ice. The dark woods implies the present state of mankind and when you think about this while listening, the words suddenly become more meaningful. I found this CD to be an expression of continuing knowledge. Knowledge from the past flows through Loreena McKennitt’s consciousness and turns into music. It is an evolution of travel and contemplation. Through her experiences, music evolves into moments of pure beauty.